The MCZ Motorsports 250 “2018 Formula One Season Review” podcast is now available! You can listen to the new edition (and all the past shows) on the MCZ Motorsports 250 page and subscribe via RSS. Or via the iTunes store. The MCZ Motorsports 250 2016 Formula One Season Preview podcast is now available for your listening pleasure! You can find it here. 1st Mercedes far ahead in testing mileage. Fast and didn’t even use the Ultrasoft tyre. Definitely sandbagging. They rebuilt Rosberg’s psyche at the end of last season but Hamilton is now refocused and the man to beat. 2nd Ferrari set fast times but put in only average mileage and had some reliability questions. The change in front suspension design should help Raikonnen but he will always be second fiddle to Vettel in probably his last F1 season. Close but no cigar. 3rd Williams put in average mileage and only went for times once in testing. This is definitely Felipe Massa’s last year in F1 and he is hoping for a good one but the lower steps on the podium are all he and Bottas can hope for, unless something goes wrong up ahead. 4th Toro Rosso. Now we come to the surprises. They put in great testing mileage and showed good speed. They will most definitely beat Red Bull Racing this year and could be a threat to the likes of Williams, lurking when Mercedes and Williams faulter. 5th Red Bull is a now a team hamstrung by their own ego. They won’t be bad but nothing spectacular is in store. Ricciardo will beat Kvyat but neither will be a threat for podiums let alone wins. 6th McLaren have improved but that wasn’t exactly hard after the 2015 fiasco! Alonso can wring ever last drop from the car, while Button is the consummate analytical racer. They won’t be the laughing stock in 2016 but they won’t be winning either. 7th Force India are better prepared than last year but a financial cloud hangs over the future of the team thanks to Vijay Mallya’s antics which will only weigh heavier as the season progresses. 8th Haas: New team problems are expected but this is a very different kind of debut. They could be the first new team since Toyota in 2002 to score points on their debut but more likely they will need to wait longer into the season, but it will come. 9th Renault admit that this will be a transition year and are setting the bar low. With a very late start in design the car is simply a re-engined revamp of the 2015 Lotus but at least they had the sense to kick Crashtor Maldonado to the curb. 10th Sauber will as always be good out the gate, and the first 3 races will probably be their best chances of scoring points. Their financial woes mean they will have precious little development of the car and the departure of Technical Director Mark Smith is a major blow. 11th Manor has gone through a huge shake up and it will take some time for things to settle. The addition of Mercedes power units is a huge plus but the teams’ lack of resources mean little in the way of development. Another set of titles for Lewis Hamilton and Mercedes – #4 for #44. The two sessions of preseason testing, totaling just eight days of running in Barcelona, are now complete and it is time to prepare the cars for shipment to Australia. Even though running was limited the teams managed to pack n the miles with the average amount of running the equivalent of twelve Grand Prix distances! 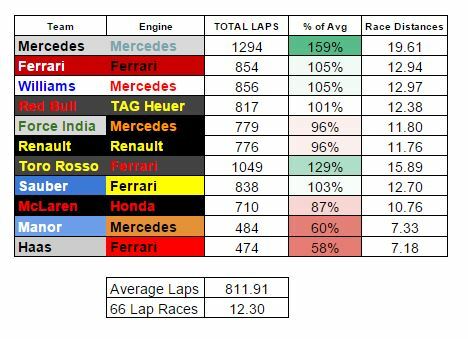 Of course some teams ran better than others and Mercedes AMG was far ahead of anyone else, running over 19 race distances while encountering just one mechanical issue. The only other team to stand out on the positive side was Scuderia Toro Rosso who, despite the last minute change to Ferrari power units, ran very reliably and put in over 1,000 laps. The middle of the pack comprised of Williams, Ferrari, Force India, Red Bull, Renault and Sauber (albeit with their 2015 car at the first test). They all put in an average amount of laps, they all suffered mechanical problems at some point and they all put in competitive lap times at times. McLaren-Honda would have also fit into that group, too had it not been for one abysmal day to end the first test where they spent all day chasing coolant leaks. It was really no surprise that both Manor with their new Mercedes power units and Haas as a completely new team both ran into problems. Both outfits ran close to 500 laps but are both going to be playing catch up at the opening flyaway races and will be lucky to be competitive. Look for our 2016 Season Preview later this week!